Installs directly into the wall -- permanent, elegant and sophisticated. Never see an electric cord or plug. Soldered seamless end caps and a superb finish. Mounts over standard electrical boxes such as 2"x4", 4"x4" or octagonal. 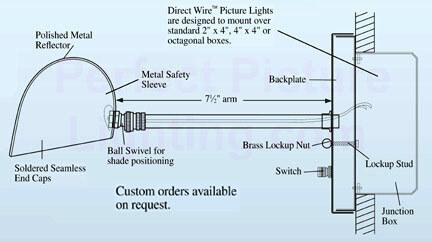 Total Extension Including Shade: 101/2"
Backplate Dimensions: 41/2" x 41/2" x 3/8"